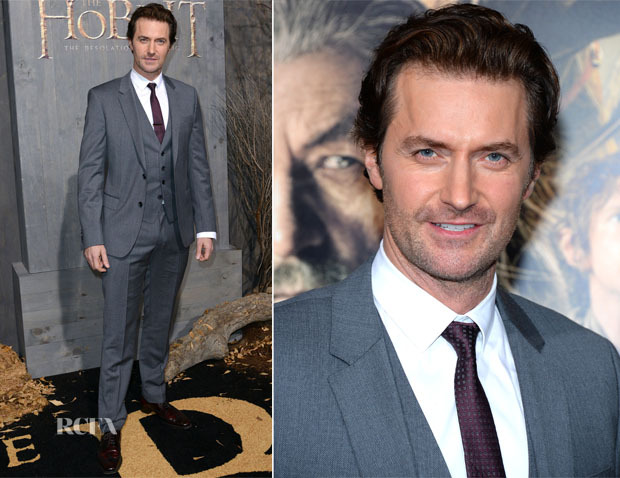 Richard Armitage was at ‘The Hobbit: The Desolation Of Smaug’ Los Angeles premiere on Monday at the TCL Chinese Theatre in California, where he also joined Orlando Bloom and Benedict Cumberbatch on the red carpet. The British actor held his own, striking a handsome stance in a slate-grey Hugo Boss three-piece suit that actually worked to enhance his baby blues. An eggplant tie with tie clip, along with patent mahogany loafers, injected a more interesting colour story here, whereas black pairings would have been far too expected. After seeing his co-stars Orlando and Benedict, how do you rate Richard’s look?